Peter B Peterson is my 3rd great grandfather. Let me tell you about him. Peter was born 11 January 1841 in Denmark. I have been fascinated by him for years. He is the first Peterson, of my line, to come to America. He came alone at the age of 18 traveling by ship, steamer and then handcart to Utah. He was a hard working man who was dedicated to his family, faith and community. Born – 11 January 1842 in Bjørup, Systofte, Falsters Sønderherred, Maribo, Denmark. Baptized – 1858 into the Church of Jesus Christ of Latter-day Saints, the first in his family. Departed for America – 20 March 1859, alone. Reunited with his parents and two of his brothers in 1862. 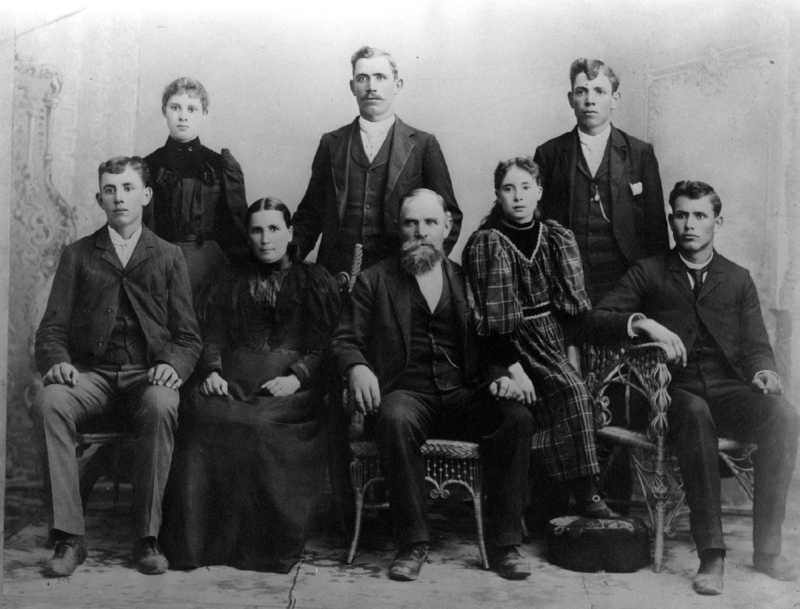 Married – 12 December 1870, in Salt Lake, Salt Lake, Utah, USA to Ann Powell, together they had 8 children. Died – 3 December 1916 in Kanesville, Weber, Utah, USA. It is said that he added the “B” to his name to help distinguish him from the many other Peter Petersons. He was 6 feet tall, had brown hair, very blue eyes and wore a beard. He served as a Bishop in his church for 22 years. He play an instrumental part in getting a Post Office in Kanesville, Utah. He helped petition the county court for a school district. The school was built just east of his home and the first teacher roomed with his family. He believed in water conservation and water rights and chose to serve on the board of the Wilson Canal Company. He served two terms as a Justice of the Peace. The entire text of the history of Peter B. Peterson can be found here. I think that is so lovely about the not being able to converse in English but knowing they loved each other. It is great to be able to have these kinds of accounts. Sadly I don’t really have anything like that for my family other than notes my grandmother made over the years about her childhood – as she didn’t like to talk about it. I didn’t know she had written them until after her death when my uncle sent them to me. I then compiled and edited them and put it into a book – along with some of her poetry she wrote. Very precious. Thank you Alex, I love that story too – it’s one of my favorite family tree love stories. I have quite a few written histories on my dad’s line but none on my mom’s line. I also just have a few notes here and there but they are all of an informational nature and about other relatives. No one wrote about themselves or their own lives. The only exception is an audio recording of my mom interviewing her grandfather. It’s pretty special. Oh wonderful! I am saving up some money to get some cine films put onto DVD at some point. I have a few done by my Dad’s father – including my parents wedding day. I know I have seen some of them but that was when I was really small and don’t really remember them. Really want to make sure we have copies of them. Old family movies are such treasures, it’s too bad research facilities don’t invest in the equipment to transfer them. It would be a wonderful service. Very true. I had an extortionate quote some years ago from some guy who was offering this swishy service to make it all HD and other things. I don’t really care about that, I just want to have a copy of the films! Hi, My great great grandfather was Peter B. Peterson. My great grandfather was Peter Powell Peterson. This has been fun to read, thank you for doing it!! Lettie is my great aunt, the younger sister of my grandmother, Mary Jane Taylor Owen. My Grandpa Charles Hanford Owen was born in 1869, as was Mary Jane. They married in 1889 & Grandpa went on a mission in 1896, leaving his small family with Mary’s parents. I will look for stories of Lettie’s marriage. Wish Mom was here as she would know. Oh Rats! And here I was thinking you were connected to the Petersons at this generation. Sorry. One generation off in the correct part of the tree isn’t too bad though (as far as my memory goes…).